Silly Wabbit, Kicks Is For Kids! 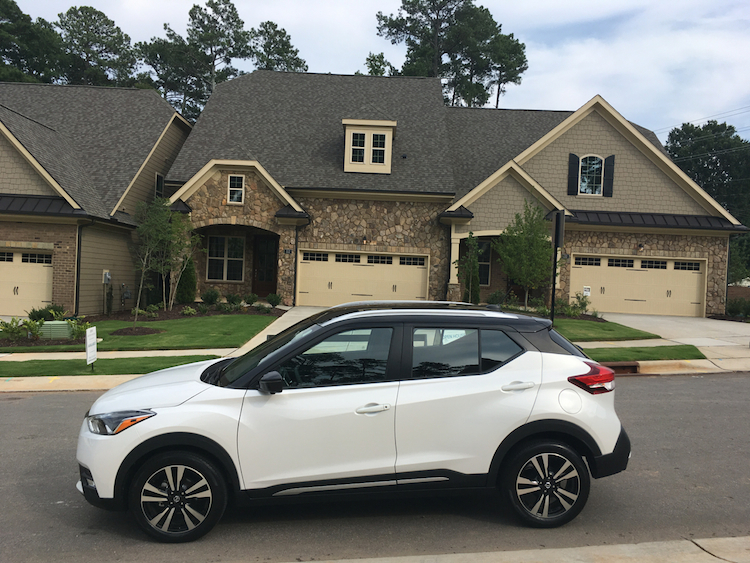 The 2018 Nissan Kicks is stylish, efficient and affordable. 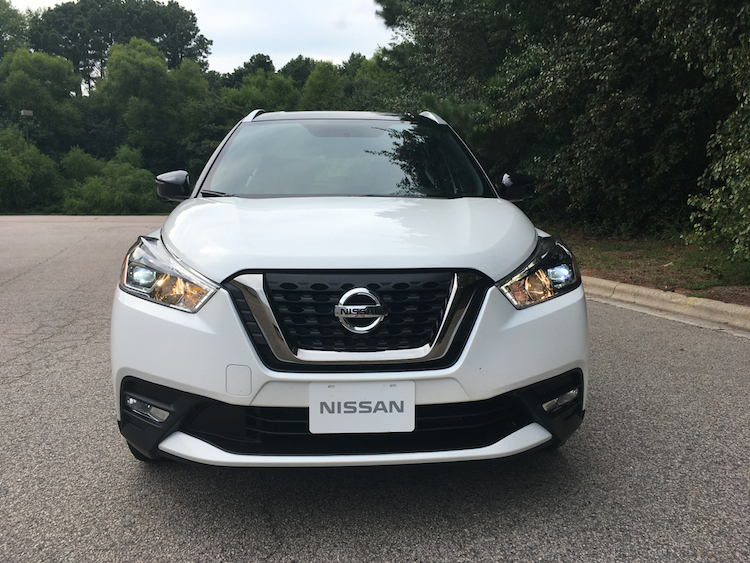 The 2018 Nissan Kicks is an all-new subcompact crossover utility vehicle, which was designed for one of the hottest and most competitive passenger vehicle segments. Its arrival this past spring enables Nissan to double-down in a market where consumers continue to move away from sedans to utility vehicles. 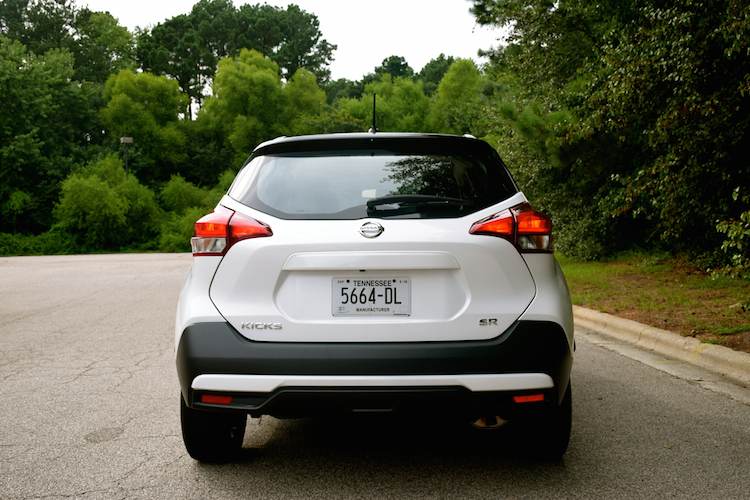 Nissan hasn’t abandoned its cars, but it is in excellent shape with its utility vehicles as the Kicks replaces the Juke. After the Kicks, shoppers might consider the small Rogue Sport or the Rogue, the medium Murano or the Pathfinder, or the full-size Armada. All except the truck-based Armada are crossovers. So, what happened to the lovable, but ugly Juke? After a seven-year run, Nissan’s polarizing coupe-like crossover is gone. Anyway, credit should be given to Nissan for bringing the Juke to the market ahead of most competitors. This writer had the opportunity to drive a pair of Jukes, including one NISMO model that my youngest son and I took on the twisty roads of the southern Appalachian mountains in June 2013. That front-wheel-drive turbocharged vehicle had a six-speed manual gearbox and handled itself quite well as we climbed and descended hill after hill and enjoyed tackling several switchbacks. Alas, the Kicks has neither a turbo nor a stick shift nor even available all-wheel drive. Good-bye, Juke…you were homely, yet fun. The Nissan Kicks is a somewhat basic package with a surprisingly big value proposition. This front-wheel-drive-only model seats five and comes with a 1.6-liter four-cylinder engine paired with a continuously variable transmission. Nissan offers the 2018 Kicks in three grades: S ($17,990), SV ($19,690) and SR ($20,290). Add $995 for the destination charge. Individual options include premium paint ($395), premium paint with a two-tone body/roof ($545) or two-tone paint alone ($150). The lone available package is the SR Premium Package ($1,000). This package includes a Bose Personal Plus sound system that has a pair of speakers in the driver’s seat headrest. 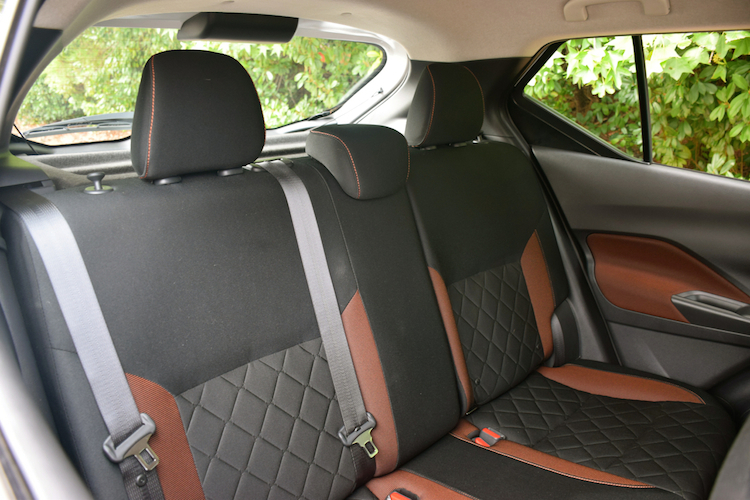 The package also brings in imitation-leather seats, heated front seats and a vehicle security system. Where the Nissan Juke once polarized, the Kicks actually soothes. Clearly, Nissan wanted to make a clean break with the previous design. And they did. Perhaps what is most interesting about the Kicks’ design is how sophisticated it looks. Indeed, the front fascia has the smallest interpretation of Nissan’s “V-motion” grille yet, which is honed by a pair of sleek headlamps. That said, the profile is the most interesting of all exterior features as if has long flowing lines and a beltline that suddenly rises ahead of the rear door handle. The two-tone look of my test model reminded me a lot of the Volvo XC40, a model that costs twice as much. 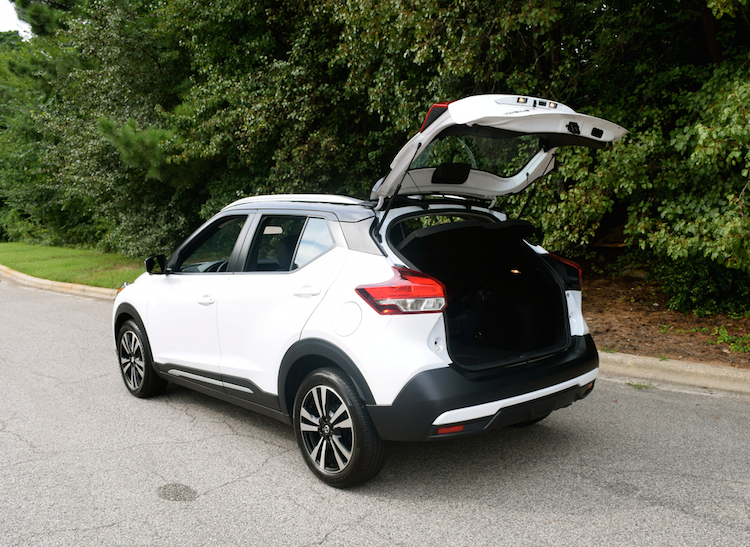 From the rear, the Kicks has a clamshell liftgate and stylish wraparound tail lamps. The standard exterior features include automatic halogen headlights, manual-folding side mirrors, 16-inch steel wheels and roof rails. Upgrades include LED low-beam headlights, front fog lights, heated side mirrors with LED turn signals, 17-inch aluminum-alloy wheels and a rear spoiler. Inside, the cabin is surprisingly refined or least it doesn’t scream cheap. Sure, you’ll find hard plastics on the doors and lower dashboard, but my test SR model offered a layered dash with soft-touch materials and double-stitched at that. The patterned fabric on the door inlay and seat bolsters were a surprise as was the quilted design of the seats. Clearly, Nissan was looking for a way to avoid the “low budget” label and they succeeded. The interior room is ideal up front, but legroom is tight in the rear. 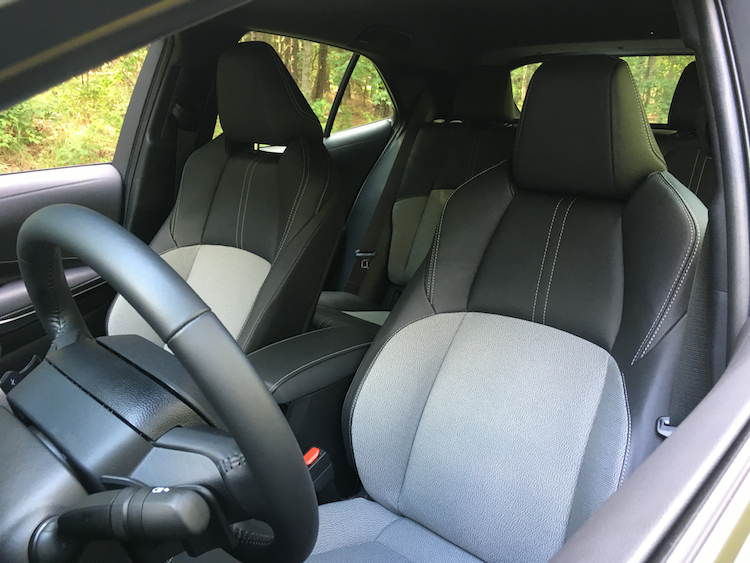 Still, two average-sized adults can sit in comfort for short trips, although families with children in booster seats should be pleased. The overall cabin layout is straightforward, if not simple, which should appeal to most drivers. 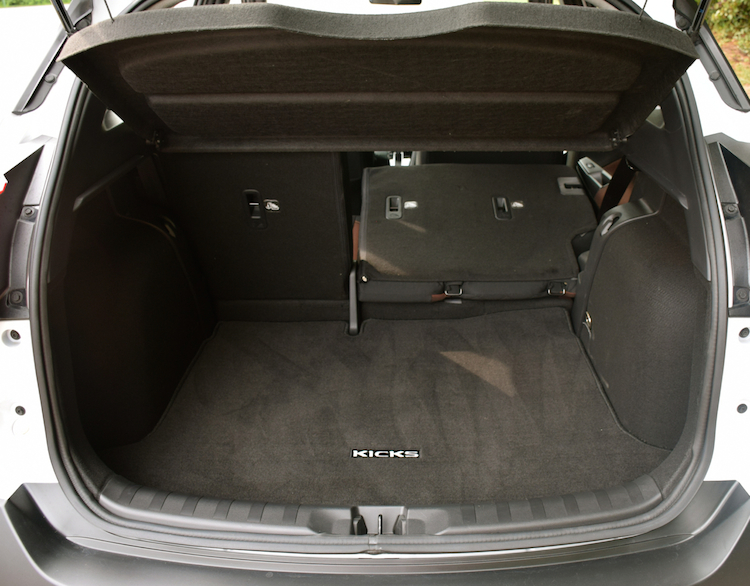 You’ll find ample storage behind the second-row seat with that space doubled once the rear seat is folded. 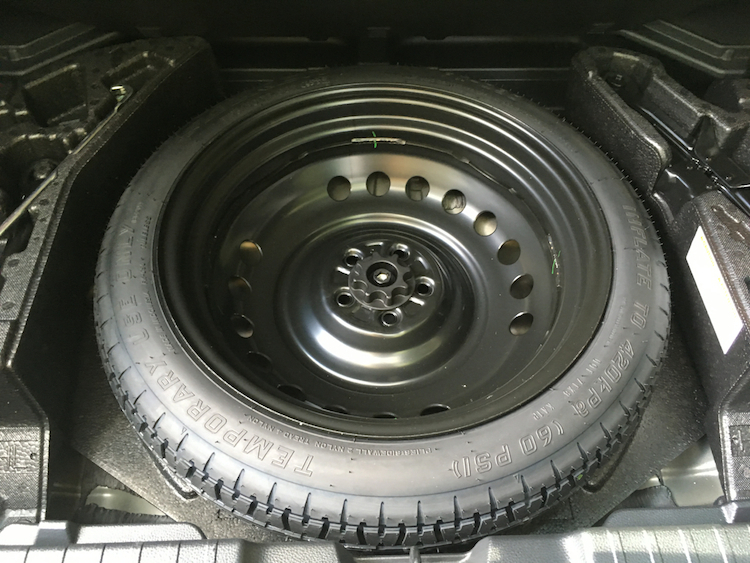 Under the storage compartment is a donut spare tire, which is encased in a Styrofoam block that holds the jack and other accessories. Among the standard interior features are power windows, power door locks, a tilt steering column, and air conditioning. The list of upgrades includes automatic temperature control and a tonneau cover. The Nissan Kicks has a standard automatic emergency braking system, although it does that without adaptive cruise control, which isn’t available. The system will warn you when you’re too close to the vehicle in front and will automatically engage the brakes to avoid a frontal collision. There are two other driver-assist features available, but not with the base model. Blind spot warning and rear cross-traffic alert are included with the SV and SR trims. 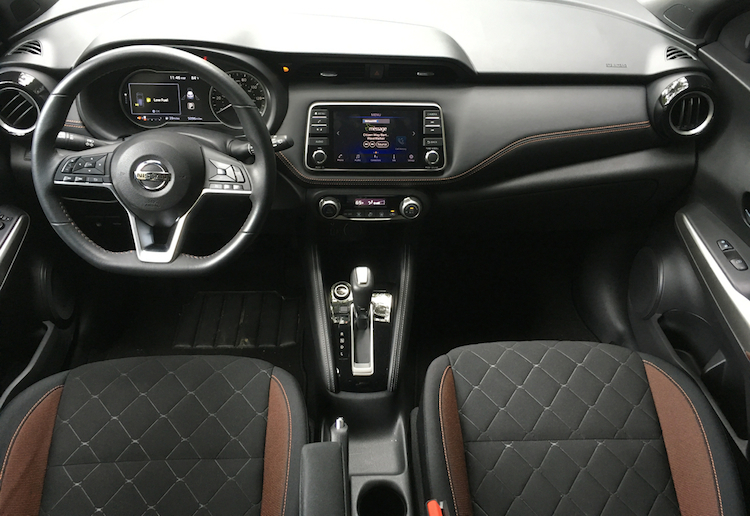 Nissan supplies the 2018 Kicks with a six-speaker audio system. The package includes a CD player, a 7-inch color display, Siri Eyes Free, Bluetooth, smartphone connectivity, USB and auxiliary audio input. Satellite radio and Android Auto and Apple CarPlay smartphone compatibility are available, but not with the base model. Also available is an 8-speaker Bose audio system. Interestingly, there is no onboard navigation system available. Instead, you’ll acquire your directions through your connected Apple or Android device. Perhaps manufacturers will eventually cede navigation assistance to third-party providers, especially as autonomous driving becomes a reality. 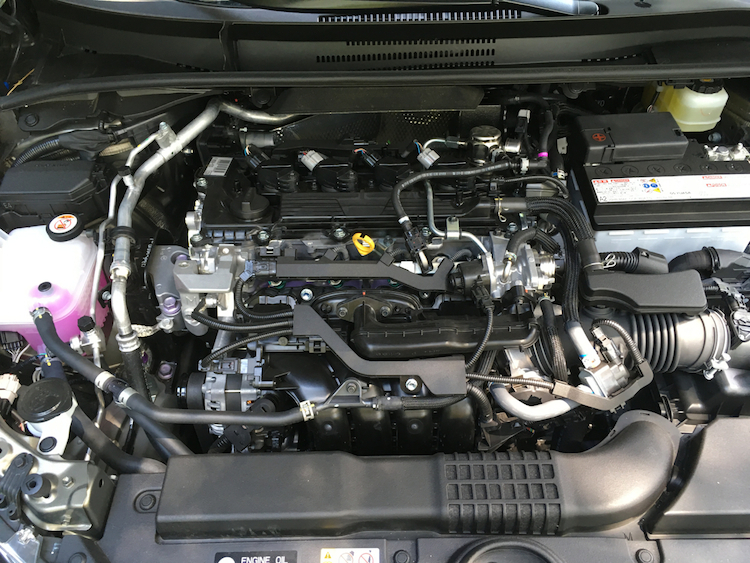 Powering every 2018 Nissan Kicks model is a 1.6-liter four-cylinder engine. Nissan matches it with a continuously variable transmission. This engine has an output of 125 horsepower and 115 pound-feet of torque. If these numbers seem tepid, you need to consider that the Kicks weighs no more than 2,672 pounds empty, which is hundreds of pounds less than some of its competitors. The Kicks’ lightweight frame means this model can get an EPA-estimated 31 mpg in the city and 36 mpg on the highway. Compare that to the 1.0-liter three-cylinder engine powering the front-wheel-drive Ford EcoSport. That model gets only 27/29 mpg city/highway. Yes, the Kicks isn’t a power maven by any stretch of the imagination. That said, its leisurely drive likely won’t put off a core segment of consumers, which are urban dwellers. The Kicks has several things going for it, including a small footprint and a tight turning radius. Both supply an advantage in high congestion areas. On the road, the Kicks’ engine drones on and on, especially under hard acceleration. That’s because it is paired with a CVT, which doesn’t supply gear shifts. But credit Nissan for including technology that eases engine noise, by allowing the engine to drop RPMs at select intervals. As for the steering, it is light to the touch and as for handling, its strong suit is with its adept maneuverability. One final point about the Kicks’ predecessor before we move on: the Juke definitely had fun driving in mind with its hatchback design, lower profile and turbo engine. The Kicks does what it has to do, by delivering reliable transportation at an affordable price. Although I don’t grade the vehicles I drive (except when I’m writing a separate review for CARFAX), I give the 2018 Nissan Kicks high marks. That doesn’t mean it is a perfect vehicle, but it does do what it needs to do and does that well. Certainly, style and fuel efficiency are important attributes for this vehicle, but it is its value that should appeal to mostly anyone. Indeed, if you were to outfit this model to the max, you’d be hard-pressed to pay $23,000 for one. Keep in mind you cannot get all-wheel drive, which is the same limitation offered by the Toyota C-HR. That said, if you want all-wheel drive and additional safety features, then the Nissan Rogue Sport is where you’ll want to shop. Its price is competitive and you’ll enjoy the improved rear seat space too. All in all, the Nissan Kicks is a strong player in the hot subcompact crossover segment. Other competitors include the Honda HR-V, Mazda CX-3 and the Chevrolet Trax. Photo copyright Auto Trends Magazine. All rights reserved. The best-selling Corolla is the most attractive one yet. The 2019 Toyota Corolla hatchback offers a sporty design and top tech features. When you have the world’s best-selling model and the market is shifting away from cars to crossovers, you have a bit of a dilemma on your hands. On the one hand, you can acknowledge the shift and reduce your investment in a new model, thereby effectively furthering its decline. On the other hand, you can always roll the dice and come up with a new plan to woo customers. Fortunately, Toyota chose the latter, at least for the all all-new hatchback version of the compact Corolla. The 2019 Toyota Corolla hatchback replaces the Corolla iM, a holdover model from the defunct Scion brand. 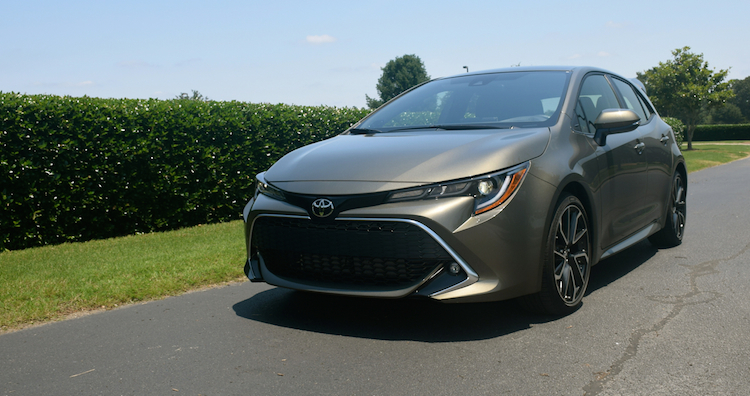 The new model offers the sportiest design we have ever witnessed on a Corolla, which suggests that the new sedan bound to follow will receive a similar treatment. The 2019 Toyota Corolla Hatchback is a compact, front-wheel-drive model that seats five. Toyota offers this attractive hatch in four grades: SE MT ($19,990), SE CVT ($21,090), XSE MT ($22,990) and XSE CVT ($24,090). Add $920 for the destination charge. Essentially, that makes for two trims along with your choice of either a six-speed manual gearbox or a continuously variable automatic transmission. All models come with a 2.0-liter four-cylinder engine. The 2019 Corolla Hatchback sits on an all-new platform, described internally as the Toyota New Global Architecture (TNGA). We saw the first application of this architecture beginning with the fully redesigned 2016 Prius, Toyota’s hybrid. Toyota followed with the midsize 2018 Camry sedan and the large 2019 Avalon sedan. Toyota’s utility vehicles and all Lexus models are undergoing a similar transformation. The platform is designed to support front-, rear- and all-wheel-drive configurations. Although Toyota has not said as much, various new all-wheel-drive models seem likely. You can bet that Toyota is watching what Ford does as it exits most car segments — add a turbo and all-wheel drive and then a Corolla “RS” hatchback model seems logical. Never have we seen a more sculpted Corolla since this model was introduced in 1966. Toyota has long advanced a winning formula with its best-seller: a simple exterior, a modest interior, average power (at best) and unparalleled reliability. Quite frankly, it is an approach that has successfully carried the Corolla ideology for decades, but now there is a need for a transformation. The new design is so noticeably different that when I asked people what they thought it was, quite a few did not immediately recognize it as a Toyota. Indeed, two thought that the new vehicle was a Mazda3, one of the most stylish models in the segment. That is how detached this hatchback is from the Corolla sedan as well as how much effort Toyota put into the new design. The sportiness is evident up front with this model’s massive, gaping lower grille and sleek, constricted upper grille. The upper portion flows out to the headlights, which offer a vibrant design marked by pronounced LED lights. The hood eases down to the grille, taking styling cues from what we hope will someday be the next Supra sports car. This model’s profile has its share of character and cut lines. The rising beltline pulls up suddenly at the rear door handles just where another set of character lines begin and sweep to the rear. A wing-like rear spoiler is one of the biggest surprises — it is neither small-scale nor is it overpowering. Sleek wraparound tail lamps, deep body sculpting and a diffuser-like finisher influence the rear. 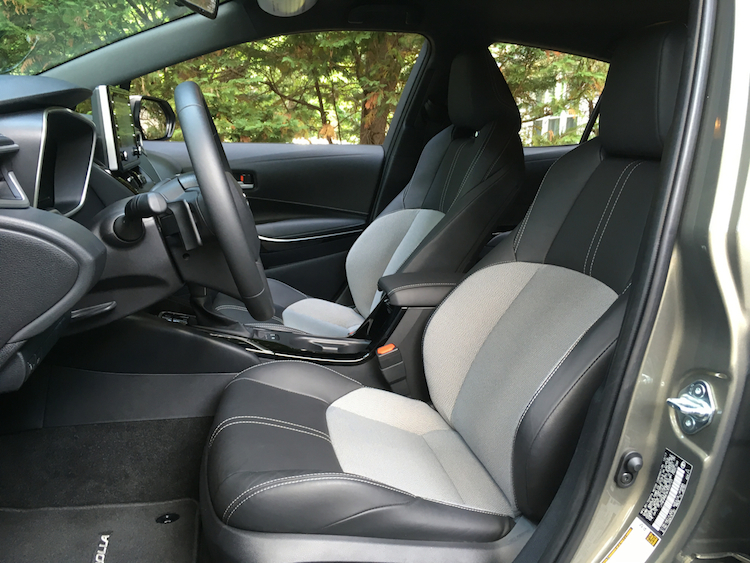 On paper, the Corolla hatchback seats five. 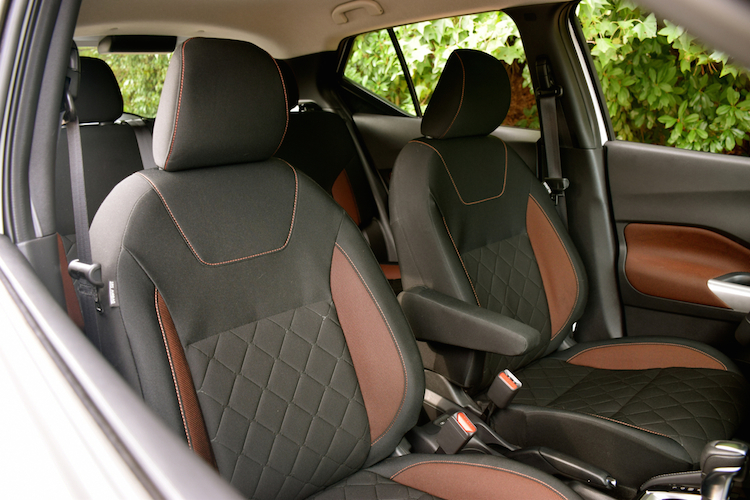 If your rear-seated passengers are diminutive or slender, then five is a possibility. Even so, this Corolla is ideal for seating four. Just as Toyota devoted much attention to the exterior, the cabin is a significant improvement as well. Of course, my test model was the upper trim XSE with the automatic, but the conventional style is the same. The layered dashboard simply looks exceptional. For instance, the instrument panel hood is situated near to the surface. Then, as your eyes scan from left to right, you cannot help noticing how well everything progresses. Further, even something as simple as the split dashboard design imparts a level of elegance to cherish. 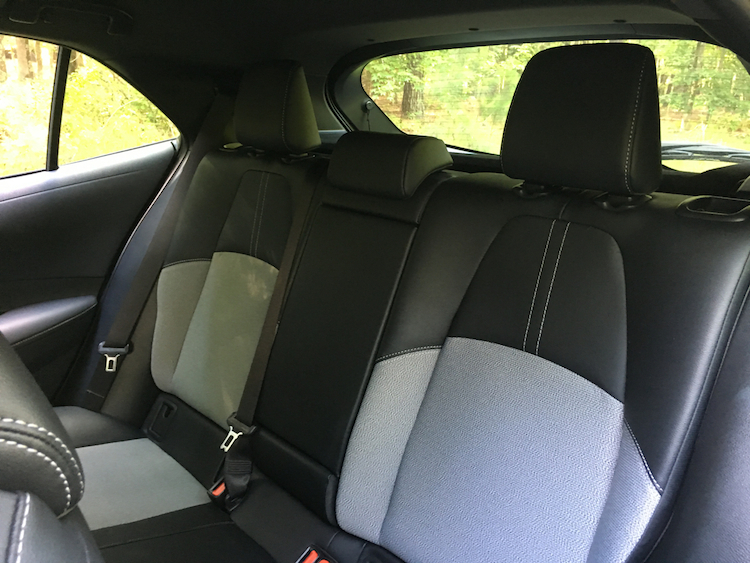 The front seats are comfortable and generally better than what you would expect in this segment. The rear 60/40 split fold-down bench seat supplies storage options as needed. Big pockets in the doors and a cleanly laid out center console are other important features. Yes, you are observing leather covering the seat or, rather, leather with a mélange-like fabric on the XSE. You do not have to go back too many years to find cars that were sparsely equipped with tech and safety equipment. In the late 2000s, a four-speaker audio system with a CD player was commonplace. Bluetooth was just getting started and USB ports were still a few years away. Satellite radio was also not yet available. Fast forward to today and most cars have at least six speakers as does the 2019 Corolla hatchback. And that is just on the base model. 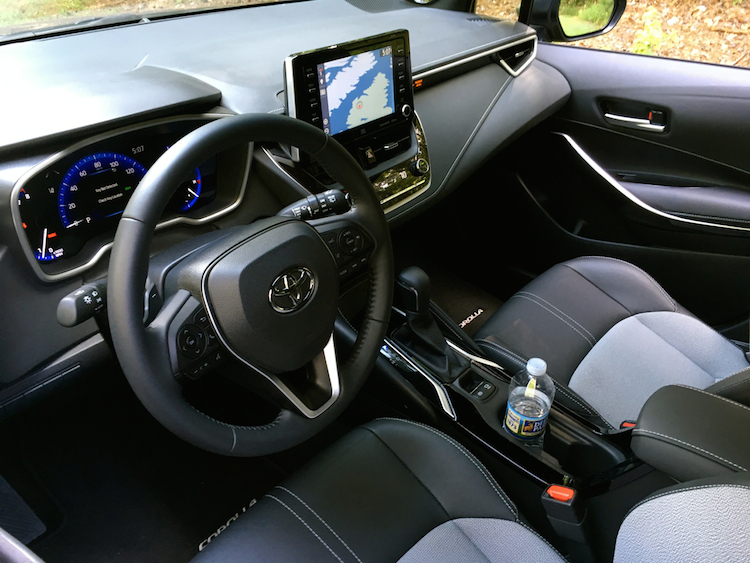 Toyota also includes an 8-inch color touchscreen, Wi-Fi Connect, USB and auxiliary audio ports and for the first time: Apple CarPlay. Sorry, no Android Auto yet. Toyota also includes its Entune 3.0 connectivity suite, Siri Eyes Free and Amazon Alexa. Upgrades include HD Radio, weather and traffic reports, connected services and an eight-speaker JBL audio system. Thus, the key features once limited to luxury models are now available with the mainstream Corolla. Among safety items, you will find the latest version of the Toyota Safety Sense suite, dubbed 2.0. Specifically, you will discover as standard equipment, automatic high beams, lane departure alert with steering assist, lane tracing assist, road sign assist, full-speed-range dynamic radar cruise control. and a pre-collision system with pedestrian detection. 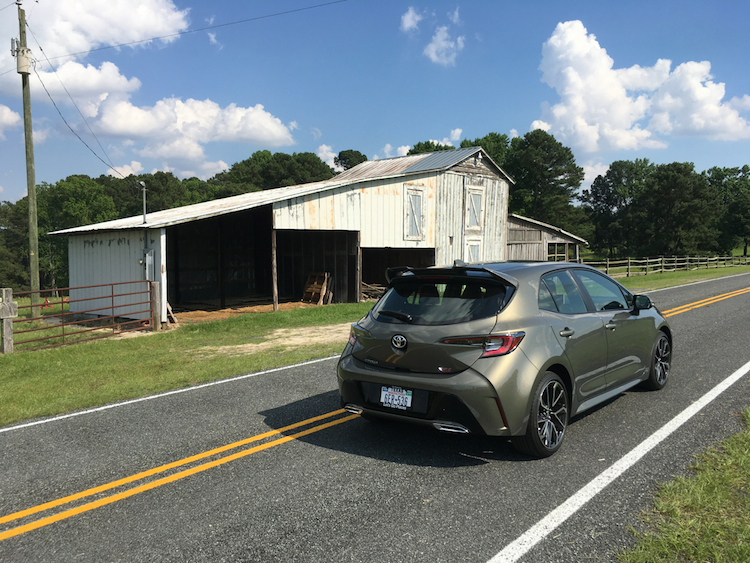 Notably, lane tracing assist is something new to Toyota, what keeps this hatchback centered in its lane when radar cruise control is on. 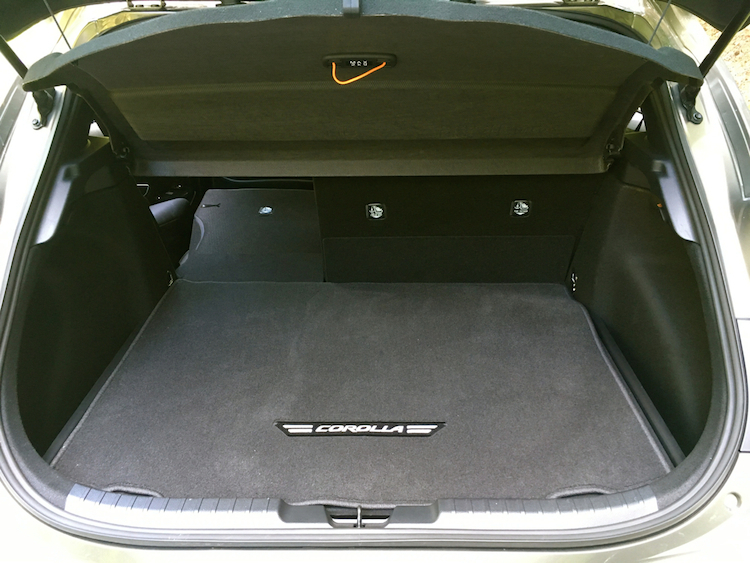 It is doubtful you will find as comprehensive of a system as the one presented in this new Corolla. Let’s Make it a Drive! 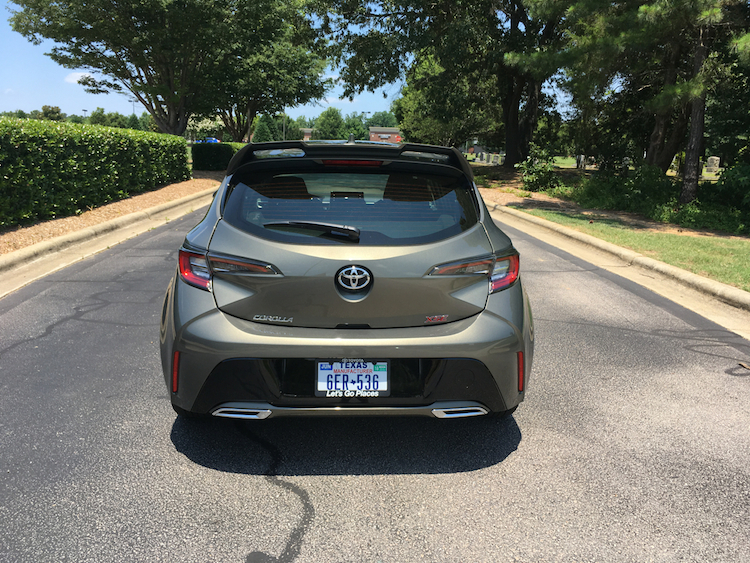 My Corolla hatchback test model arrived just two months removed from my California trip where I tested the new model (and the 2019 Avalon). Toyota supplied manual and CVT versions of this model — so kudos to this automaker for offering standard three-pedal foot action with both trims. Alas, the relatively smooth-shifting manual version was not my weekly driver, but the CVT should please the majority of people. And if you do have a hankering for shifting, you can place the transmission in sport mode and play with the paddle shifters. Those shifters mimic 10 forward gears. The Corolla’s engine is matched well with this model, delivering 168 horsepower and 151 pound-feet of torque. No, it is not particularly fast — it offers steady step-off acceleration and ample passing power. 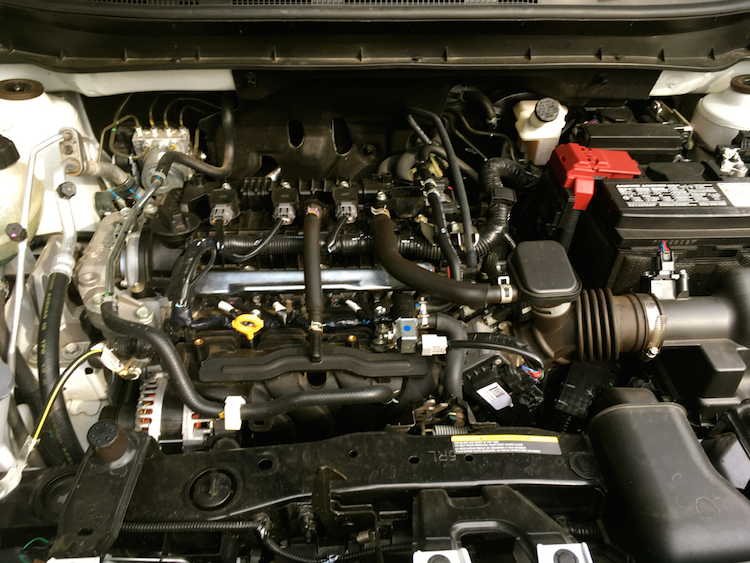 However, Toyota did gear this powertrain for optimum fuel economy — it delivers an excellent 42 mpg on the highway. The steering offers satisfactory feedback. But the most enjoyment takes place on twisty roads where this model does a satisfactory job of hanging the curves. 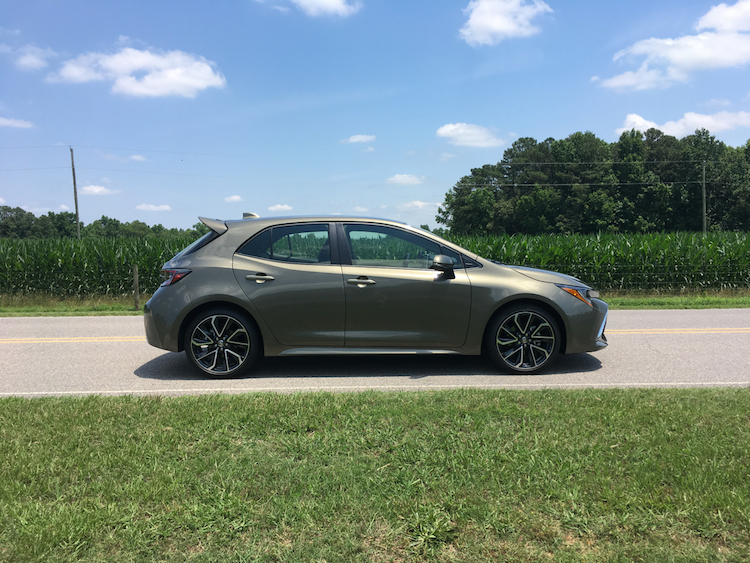 Size certainly makes a difference with any front-wheel-drive model and the new Corolla holds its own as it pulls out of corners. That said, here is hoping Toyota will go beyond the base model and offer us more powerful versions. Perhaps add a turbo to give us something close to the 252 horsepower and 270 pound-feet of torque with the Focus ST? Then use that as a prelude to a Focus RS fighter with all-wheel drive and 350 horsepower at the ready! One can imagine, right? Once again, Toyota brings the appropriate product to the market. Back around 2010, Chairman Akio Toyoda promised us that more exciting models were on the way, acknowledging that although vanilla is a dependable flavor, it does little to stir the imagination. The Corolla hatchback is the latest model to keep that pledge and we are happy to see the direction the brand has taken. Beyond the sporty design and refined interior, the long list of standard driver-assist features makes this model a strong entrant in the shrinking, but still very competitive small car segment. Toyota’s advantage in having the newest model on the block should also serve itself well, especially as competitors leave the segment or slow their updates. Thus, if you put this one on your short list, you will quickly learn what a strong contestant it is straight out of the gate. 2019 Toyota Corolla hatchback photos copyright Auto Trends Magazine. All rights reserved.